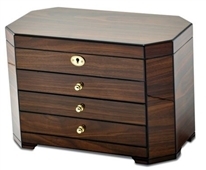 Jewelry boxes for women: unique selection of styles, designs, locking. 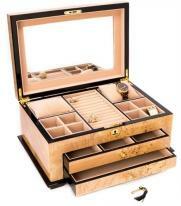 Women's jewelry boxes are hand-made and luxuriously lined. 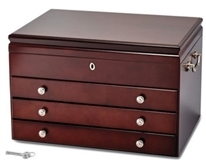 Our selection of women's jewelry boxes range from small boxes to large standing jewelry armoires. 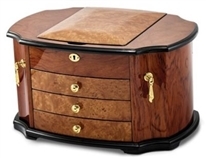 They are luxury jewelry boxes built to withstand the test of time, and to store her jewelry pieces for decades, and then passed on as valued heirlooms. 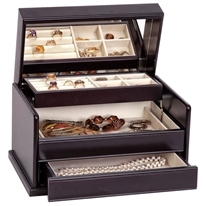 The womens jewelry boxes that we sell are handmade and are offered across a wide price range: they are both unique and affordable. You can buy a women's jewelry box for her dresser top or closet shelf, or a standing armoire that adds to the bedroom decor. They are a luxurious heirloom that she'll have for a lifetime. Questions? We welcome your call at (800) 804-2542.